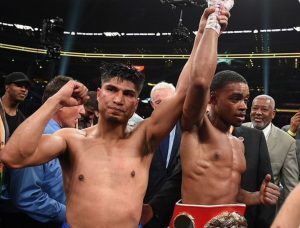 As the clock inevitably ticked along during the leadup to the IBF welterweight title fight last weekend in Dallas, Texas, a popular opinion began to take shape: Mikey Garcia had a real chance at beating Errol Spence Jr. This narrative was far more than the work of contrarians. There were even some well-known fight game figures who ended up picking Garcia to win. The California multi-titlist didn’t win, of course. Texas native Spence ended up beating Garcia handily, and in completely one sided fashion, at AT&T Stadium on Saturday. This could be blamed on the size difference between Spence, an active welterweight, and Garcia, who has lately been hovering in the lightweight/super lightweight divisions. More likely, however, is Spence was simply the better fighter of the two men. Garcia is a gifted fighter, true, but Spence is a supremely gifted fighter. And that makes all the difference when it comes to these matters. Still, Garcia was taking on a huge challenge simply by facing a man Spence’s size without first taking a swim in the welterweight waters to see how he held up. It was only reasonable to expect Spence to come out victorious in highly convincing fashion on Saturday. The question, then, is why so many ended up being in the camp that believed Garcia just might pull off the upset? The answer may be found by thinking back over a year and a half ago, to when UFC star Conor McGregor convinced a ton of people that he could step into the ring and best Floyd Mayweather in his very first boxing match. Just how marketable was McGregor’s confidence leading up to the Mayweather fight? Marketable enough for the bout to nearly break financial records. McGregor believed, so others believed. Confidence proved to be an extraordinary selling point in the summer of 2017 (not that it ultimately did McGregor a whole lot of good in the ring against Floyd). Likewise, Mikey Garcia’s quiet confidence convinced many that he was a real danger to Spence. Serious fight fans have long known that Garcia is a deliberate person. He tackles the sport of boxing with such professionalism that his words carry weight. When he claimed he could beat Spence, people felt he knew what he was talking about. No one should be accused of stupidity, however, for assuming Garcia had a real shot of attaining greatness last weekend in Dallas.